Dutch house-label founded in 1992 by Gaston Steenkist and René ter Horst aka DJ Zki & Dobre. Fresh Fruit Label designed by Hakan Coskunsoy. Fruit 018 The Good Men Huh! In 1993, Fresh Fruit was a label one could not deny in the Netherlands. The Good Men, Rene & Gaston (2x), Klatsch, Fresh Tunes #1, Ricky Rouge, Jark Prongo, all became massive club hits (some of them also in the mainstream pop charts) but also landed on the personal favourite lists of many DJ's and dance music fans. "Vitamins for your turntable" was an often heard statement (the Fresh Fruit logo was based on the then popular brand of Dutch fruit jelly Delmonte). "Colourful" was another, probably in an attempt to show the various styles of music the label covered, but also the plain outer sleeves; put the first 8 releases plus the remix of "Oh Boy" next to each other and one spans a multitude of colours: white, red, yellow, green, blue, black, white, orange, gold. 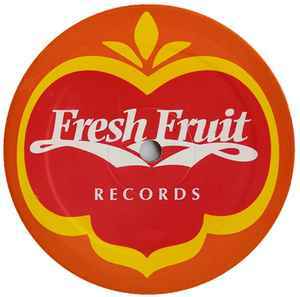 It is also worthwhile to note that Fresh Fruit was one of the first labels to be run by deejays (Djax may be the first). This transformed the role of a DJ: apart from playing tunes, remixing other people's work, creating beatmixed compilations and making their own music, trading, licensing and recruitment became part of the job. Later on, other DJs followed, most notably Olav Basoski & Erick E. (WORK Records). In 1994 and 1995, more releases followed (follow-ups for aforementioned names, a remix of Warp 69 "Natural High"), but they were not as successful and the first eight releases, and at the beginning of 1996, activity stalled. In 1998, the label was brought back to life by Olav Basoski who used it as his speedgarage outing (Les Indiscrêtes). Later on, the label released mostly filterdisco, most notably the "Groove Lab" EP series. Five years later, the label got out of focus once again and stopped in 2005. However, what remains is a label whose releases were exactly as described: a refreshment for your ears; groovy, happy and melodic.